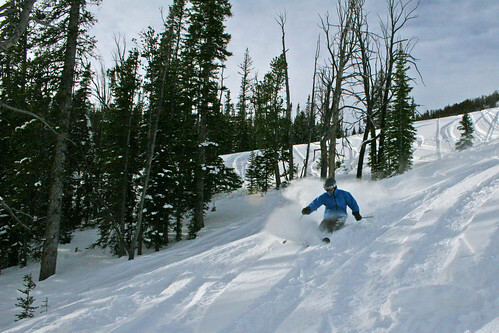 Flat Iron, Andesite and Lone Peak make up Big Sky Resort—"The Biggest Skiing in America." 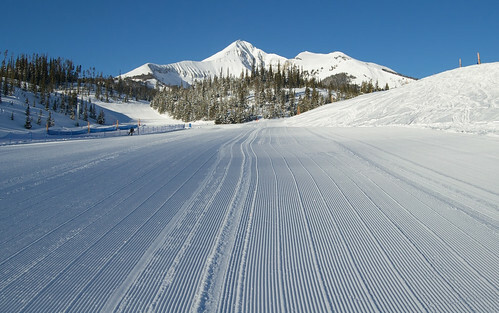 Photo Courtesy of Big Sky Resort. Spend three days skiing [R48R, Big Sky Resort] to check it off your bucket list. The resort hangs “The Biggest Skiing in America” tagline around its neck, but just to ski Big Sky’s lifts won’t get you there. You’ve also got to ski [R1512R, Moonlight Basin] to balloon into the most acreage in the U.S. Ski runs flank three mountains—Flat Iron, Andesite and Lone Peak. The highest is Lone Peak, stretching up to 11,166 feet in elevation. Four massive faces split onto the Big Sky and Moonlight sides. You’ll need the combined “Biggest Skiing in America” lift ticket to ski both, but there's more than enough terrain to appease almost any skier or rider. 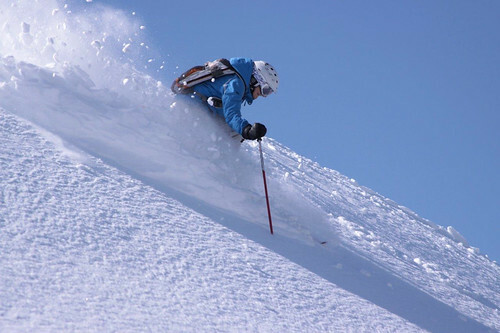 With a Big Sky lift ticket, ease into the altitude by skiing lower elevation runs on all three mountains. Start with gentle cruising from Andesite’s 8,800-foot summit and smaller Flat Iron Mountain. Hop the Ramcharger up to the summit and warm up on Southern Comfort groomers. Like the lift’s name, the runs go down easy. Big Sky buffs out plenty of groomers for warming up. Photo by Gorgonshead NH/Flickr. Shift east to the steeper runs on Thunderwolf Quad to venture into the new Wolverine glades or the near 20-degree pitch of Mad Wolf glades. Continue the fun in the trees on the Ramcharger side, dropping down Congo and adjacent runs. Stop for a Montana-style lunch of Game Chili (elk, bison, and beef) at Peaks, located near the base of Ramcharger. After refueling, you’re ready to tackle Lone Peak’s lower elevations. To move the post-lunch muscles, cruise a long groomer such as Crazy Horse or Calamity Jane on Swifty, the local’s name for Swift Current Quad. The wide-open Country Club drops into Gullies. Photo Courtesy of Big Sky Resort. Then, spend the afternoon bumping up to 9,000 feet in elevation by bouncing between the Challenger Lift and Lone Peak Triple. Cycle through the wide-open powder of Country Club face and take several laps of the South Wall from the Turkey Traverse. 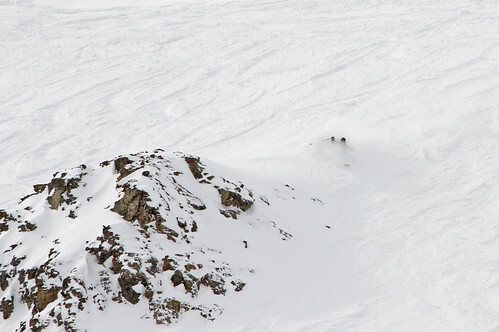 The Challenger Lift offers open bowls and glades. Photo Courtesy of Big Sky Resort. When the lifts shut down, head back to your room at the Village Center Inn, the newest lodging property at Big Sky Resort. Have a dip in the hot tub to rest those weary muscles before dinner. Then, dine downstairs at Andiamo Italian Grille, where the scents of fresh sauces transport you to Tuscany and the desserts are edible forms of art. Follow the locals to grab a quick breakfast sandwich at the Lone Peak Cafe. Now that you’ve had time to acclimatize, you’re ready to tackle the summit of Lone Peak with a Big Sky-only lift ticket. Choose a lower mountain run for warming up before hopping the tram. Big Sky’s tram runs on most days. During heavy storm cycles, it can shut down while ski patrol catches up on avalanche control. At the tram’s top, walk 100 feet to the summit of Lone Peak. If you haven’t felt woozy at the elevation yet, you may feel it here. The peak plummets down a dizzying distance. On Lone Peak’s southern face, dive down Liberty Bowl. The open bowl yields endless turns before timberline. Head to skier’s right to hit the Dakotas, a series of natural glades. Lap the Dakota Triple to ski the Bavarian Forest. The Dakotas offer a plethora of powder skiing in the trees. Photo by Jen Rook. When hunger pangs begin, no need to ski all the way back to the village. Instead, scoot east to the Shedhorn Lift. You’ll ride right above the new Shedhorn Grill yurt and can descend to Tower 11 for a flame-roasted elk or bison brat. Take a second lap on Shedhorn after lunch before catching the Duck Walk back to the Lone Peak Triple to reach the tram again. Repeat the morning’s runs with different lines or up the ante by hitting Lenin and Marx to reach Shedhorn. You can also circle the Bowl’s north rim to drop through an A-Z Chute. When your legs wobble, head to Whiskey Jack’s for local Montana beers. After après, pop in the C and P Grocery to pick up adult beverages and wear your ski gear for dining at the Montana Dinner Yurt, a 20-minute snowcat ride from the village. The cozy, wood-heated yurt yields a yummy dinner featuring filet mignon with peppercorn sauce followed by chocolate fondue. 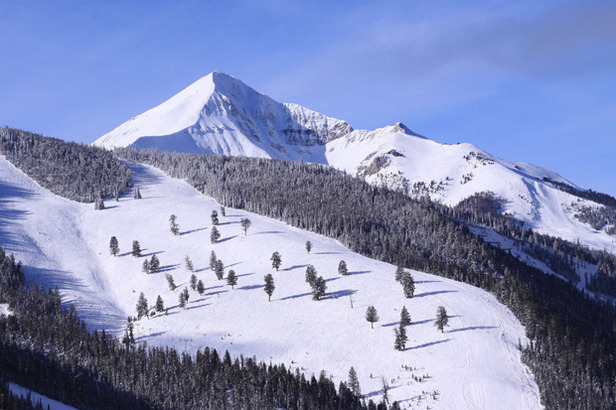 Purchase a “Biggest Skiing in America” lift ticket to access Big Sky and Moonlight. Catch the tram to ski Moonlight’s North Summit Snowfield. You’ll need a buddy and avy gear. The patrol allows only one party every 15 minutes to keep the wild feel of the snowfield. Mary Ball skis the North Summit Snowfield at Moonlight Basin. Photo Courtesy of Moonlight Basin. A short icy pitch curves around to the snowfield, which unfolds with fluffy turns. Stay in the center to avoid the wind scoured rocks. Work your way through rock-flanked chutes until you peel out on a broad snow apron in Deepwater Bowl. Connect in with Horseshoe, Moonlight’s longest run, to reach the base of the Six Shooter Lift. Ride up Six Shooter to ski through Stillwater Bowl to the Lone Tree Lift. Its trees harbor powder shots when other areas get skied out. When lunch calls, stretch out the GS turns on Ice House and Meriwether to reach Moonlight’s Madison Base area for lunch at Headwaters Grille. 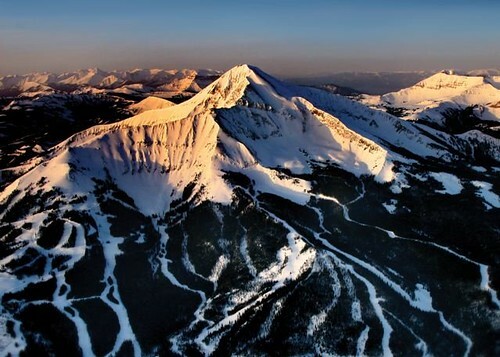 An aerial view of Moonlight Basin, Montana. Photo Courtesy of Moonlight Basin. After lunch, head back up Six Shooter and either hike uphill to reach the Headwaters Lift, or catch Fast Lane to swing around to Big Sky’s Challenger Lift that will take you to the Headwaters area, too. The Headwaters Chutes vary in degree of difficulty. The further west you go, the harder they get. Spend the afternoon lapping Headwaters or ride back up the tram for one last top-to-bottom run. Either way, cap your trip with a final stop at Lone Peak Brewery for the Headplant Pale Ale. With tired legs and a good beer buzz, who wouldn’t be spent? Now get out there and experience the Biggest Skiing in America for yourself.